Do you go big for Valentine’s Day, or do you keep it low-key? Whether you prefer going to a fancy restaurant or keep things simple by spending the occasion at home, it’ll be nice to splurge on something that makes home life a little more thoughtful and beautiful! Be it a partner, friend or little one that you’re going to celebrate this romantic day with, we’ve prepared a list of goodies to help find your own unique and heartfelt way to say ‘I love you’! 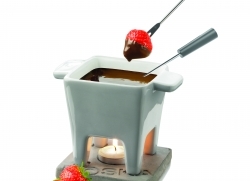 This Tapas Fondue by Boska consists of a ceramic fondue pot with two fondue forks, a concrete base, and a tea light to top it off. The smaller size of this set is well suited for two people to enjoy Spanish tapas or Dutch snacks, while the tea light creates ambience and a warm, cozy atmosphere. In addition, the fonduepot can be used in the microwave so the cheese can be melted quickly – less time in the kitchen and more time with your date! 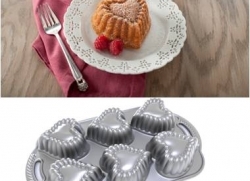 Bake lovely cakelets for your sweetheart with the Heart Cakelet Baking Pan from Nordic ware. The cast aluminium baking pans provide fine details and superior baking performance. The non-stick coating makes for easy release and clean-up! 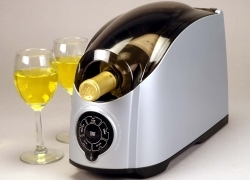 Great for date nights at home or for picnics, the Rapid Beverage Chiller from Cooper Cooler quickly chills room temperature beverages down to a cold and refreshing drink. Just pour ice and water into the Cooper Cooler, select the container setting, and the cooler does the rest. The patented process chills by rotating beverages while simultaneously spraying them with ice water. The appliance will cool a 355ml beverage can from 25°C to 6°C in about 1 minute. The “extra” chill setting chills beverages to 1°C. The cooling process will not affect your drink’s taste, composition, or cause carbonated beverages to fizz and explode upon opening. 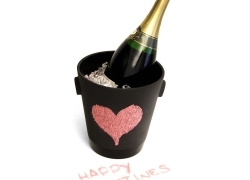 Long gone are the days of bulky buckets filled with ice to keep your wine or champagne chilled. By combining both functionality and modern art, we now have the sophisticated and chic Magisso Naturally Cooling Ceramics Champagne Cooler! Just soak the Naturally Cooling Ceramics in water for a minute or two before use. It will keep content cool for two to four hours. You can even write a love note on the side of the Ceramics with a chalk! The Cuisinart Belgian Waffle maker will make the perfect Valentine’s Day gift for your loved one. They will love you even more when you wake them up to a lovely breakfast in bed! If you think your sweetie deserves a special treat this Valentine’s Day, surprise them with some festive red velvet or strawberry waffles to set the mood! The Cuisinart® 4 Slice Belgian Waffle Maker cooks golden waffles that are crispy on the outside and fluffy on the inside. 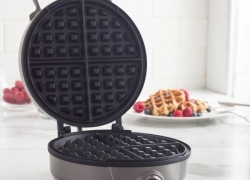 With a stylish brushed stainless steel cover, the waffle iron offers an adjustable temperature control with six browning settings for ultimate control. Need inspiration? Check out our Classic Waffles recipe or Vanilla Waffles recipe. Serve up sweet treats using the all new range of Jamie Oliver bakeware, and you’ll be winning hearts all day! With a selection of pans and baking tools, it’s easy to make the perfect cupcakes, cookies and even a cake that’s sure to, well, take the cake. 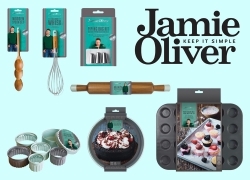 Each piece has been smartly designed to help turn out show stopper cakes and melt-in-the-mouth dishes time after time! Decorate them with bright icing and sprinkles, and create picture-perfect displays using stands and elegant doilies from Meri Meri . 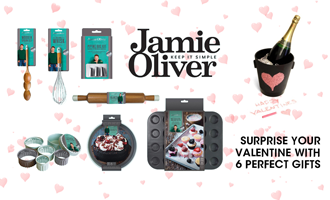 When you’re equipped with these, your valentine will surely be impressed! Click here to view Meri Meri products. *Shop for more unique gifts now with the Valentine’s Day Sale from 3 – 14 February!